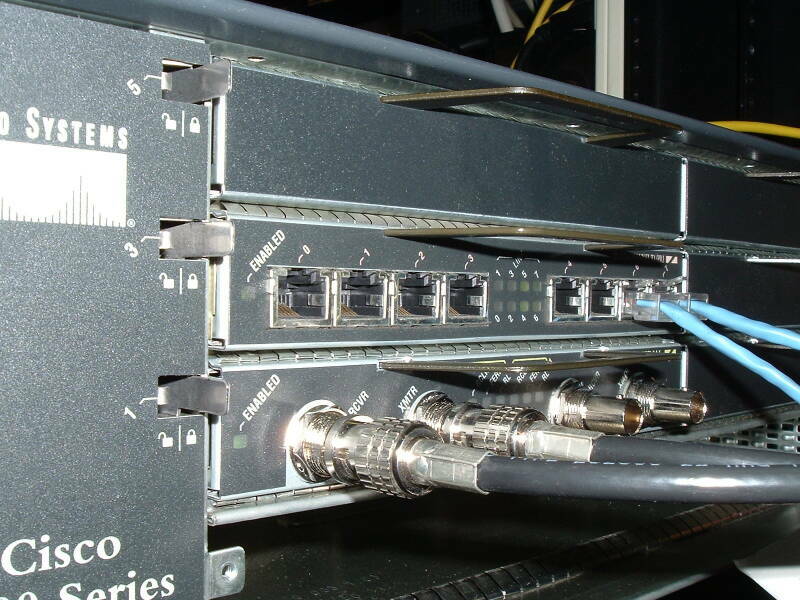 Wide-Area Networks or WAN links are telecommunications infrastructure connecting networks across broad geographic areas. They typically have the topology of point to point connections. This is what carriers and backbone providers use to connect cities. The T-carrier system was introduced by Bell in the U.S. in the 1960's. It uses time-division multiplexing to interleave multiple pulse-code modulation signals on a shielded conductor in each direction. Twisted pair at lower speeds, coaxial cables or optical fibre at higher speeds. E-carrier is similar, used in Europe. E-carrier can support higher data rates for a given bit rate as it uses all eight bits per channel for signal coding. SONET (Synchronous Optical Network) is much faster — you're generally talking about Internet backbone links. 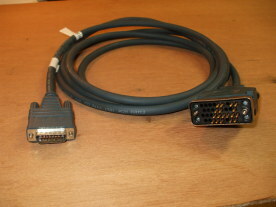 Cisco V.35 cable used to connect to a T1/DS1 WAN link. San Luis Obispo, California is the AT&T landing point for five out of six trans-Pacific cables. They come in under the beach at Montana de Oro State Park and run "2,200 feet through a 5-inch drill pipe to a manhole," then run a mile to 9401 Los Oso Valley Road in San Luis Obispo. 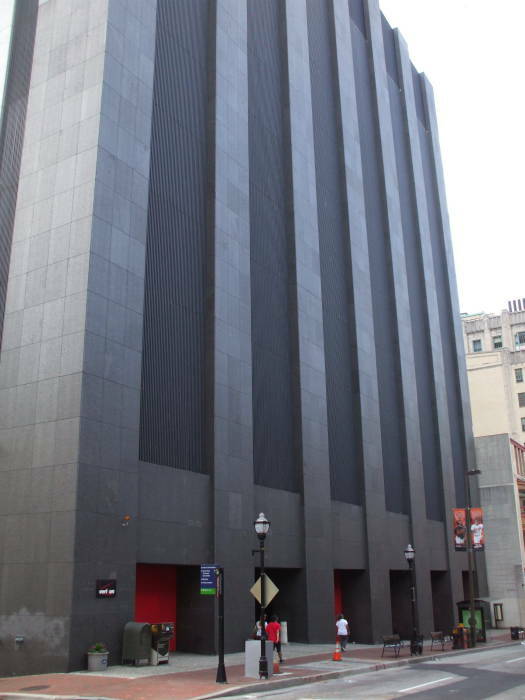 San Francisco, California notoriously has the major IXP on the 7th floor of 611 Folsom Street. One floor down is room 641A, labeled "SG3" for "Study Group 3", where the NSA captures traffic with a Narus STA 6400. San Jose, California has MAE West on the 11th floor of 55 Market Street. Los Angeles, California has the Any2 Exchange at One Wilshire. It is a major interconnection point for the Pacific Rim countries. 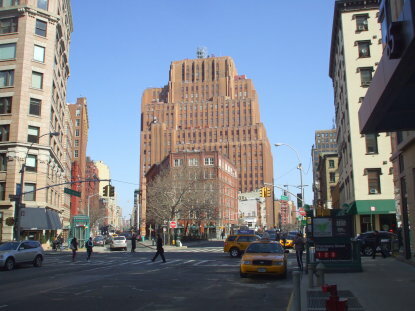 60 Hudson Street, the former Western Union Building and still a major telecommunications interconnection point. Tuckerton NJ and the surrounding area is the landing site for a number of cables to Europe, the Caribbean, and South America. New York, New York has 60 Hudson Street, the former Western Union Building and its headquarters until 1973, and still a major world communications nexus. It's a carrier hotel with over 100 telecommunications companies interchanging Internet traffic. 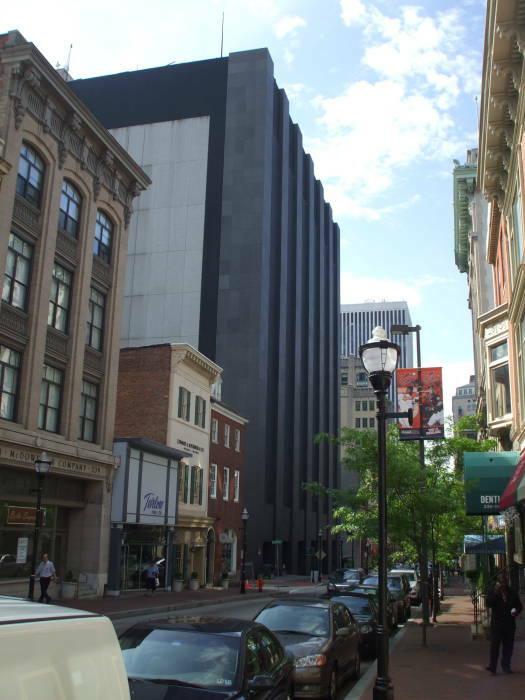 Another major carrier hotel is at 60 Broad Street, just off Wall Street. See my page dedicated to the visible telecommunications infrastructure in Manhattan for more. Vienna, Virginia has MAE East at Suite 400, 8100 Boone Boulevard. It used to be in the corner of the parking garage.... That's just across Leesburg Pike from the Tysons Corner Shopping Center. Ashburn VA has the Equinex IXP at 21830 UUNET Way. Miami, Florida has the NAP of the Americas at 50 NE 9th Street. It's owned by Terramark and routes traffic between Latin American countries and handles about 90% of the traffic between North and South America. Bridgeton, Missouri is the site of AT&T's Network Operations Center, at 12976 Hollenberg Drive. PeeringDB — a list of peering networks interconnected at IXPs. Frost forming on the cold dewar from which liquid nitrogen is being drawn. Two liquid nitrogen dewars on the corner of Broadway and John Street on the edge of the Financial District in Lower Manhattan. Nitrogen is most efficiently stored and transported in liquid form. 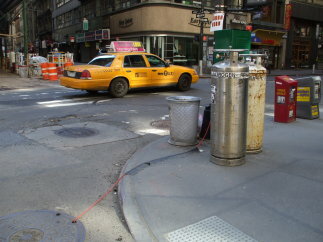 The red hose running across the sidewalk and down into the manhole provides a constant supply of dry nitrogen for the conduits carrying the many telecommunications circuits running underground. 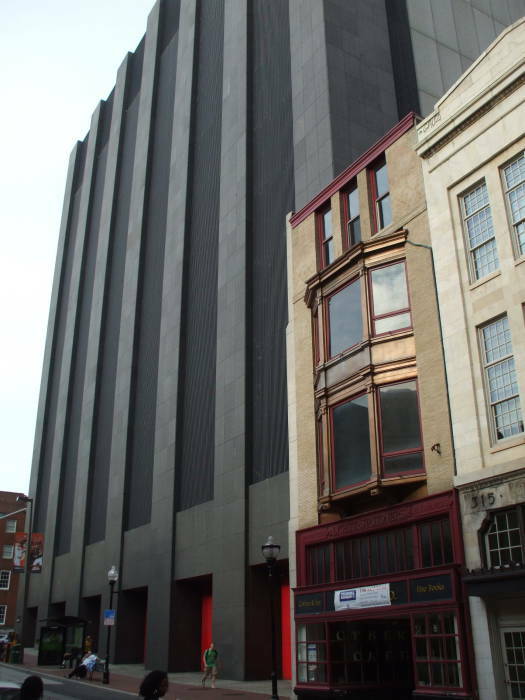 This is the Verizon switching center on Charles Street at East Pleasant, in Baltimore, Maryland. You know that there has to be a fat pipe between here and the nearby Fort Meade.